On Oct. 17, 2018, the American Society of Anesthesiologists’ (ASA) House of Delegates adopted an amended version of its Statement on the Anesthesia Care Team (ACT). To be clear, the AANA has opposed the ACT Statement since it was first approved by the ASA in 1982, and is equally opposed to the recent amendments which promote even tighter practice and educational restrictions for CRNAs and student registered nurse anesthetists (SRNAs). The purpose of this letter is to inform you of the AANA’s next steps regarding the amended ACT Statement based on a thorough review of the document which has been undertaken by AANA legal counsel and staff, and by the Council on Accreditation of Nurse Anesthesia Educational Programs (COA). The amended ACT Statement remains problematic for the AANA, CRNAs, and SRNAs because it attempts to diminish the role and value of CRNAs in patient care, misrepresents the way CRNAs and anesthesiologists work together, and seeks to impose stricter limitations on the clinical supervision of SRNAs with no evidence to support the need for such action. You can read the full statement on the ASA website. The statement is not in any way legally binding on facilities or providers, nor does it have any authority over the regulation of nurse anesthesia educational programs. The SRNA supervision requirements promulgated by the statement are inconsistent with and more stringent than those of the Centers for Medicare & Medicaid Services (CMS) and many state laws. The amended ACT Statement does not recognize that anesthesia care can be provided by a non-medically directed CRNA, when clearly it can be. The definition of “immediately available” in the ACT Statement has not been adopted by CMS in its Medicare anesthesiologist Part B medical direction policy. Designate a specific point of contact for members concerning this issue. To that end, should you detect changes in your workplace or clinical education sites as a potential result of the ACT Statement or have questions on this matter, or encounter payors using the ASA’s definition of “immediately available” in their materials, please contact AANA Chief Clinical Officer Lynn Reede, DNP, MBA, CRNA, FNAP, at lreede@aana.com or (847) 655-1136. As always, the AANA will keep you apprised of new developments as this matter continues to evolve. Veteran's Day is this coming Sunday, November 11, 2018. AANA extends its gratitude to all CRNAs and SRNAs who have served in the U.S. military. We honor your sacrifice and your contributions to the freedoms of the United States. "Every breath, every beat, every second, WE ARE THERE!" Join your fellow CRNAs and SRNAs to revel in the week that celebrates you and the profession of nurse anesthesia. Merchandise for the 2019 National CRNA Week (January 20-26, 2019) is now available. With the holidays fast approaching, get your supplies now! Shop here! The AANA CMS Quality Public Reporting page has been updated with new information about the Physician Compare website. With the transition from the Physician Quality Reporting System (PRQRS) to the Quality Payment Program (QPP), the consumer web pages and Downloadable Databases will reflect participation by individual providers or group practices in either the Merit-based Incentive Payment System (MIPS), or one of the Advanced Alternative Payment Models (APMs) for the 2017 Reporting Year. CMS anticipates publishing updates to the Physician Compare website in early 2019. In the meantime, providers can review their MIPS scores from Year 1 2017 data through the Performance Feedback Report, which is available on the CMS Quality Payment Program website. Enterprise Identity Management (EIDM) credentials are required to access information. Weren’t able to join us for the AANA Insurance Services/Mercer webinar this past Monday night? View the webinar in its entirety here. For 2018, which is Year 2 of the Quality Payment Program, providers are required to report Quality Performance category data for a full twelve-month period (January through December). The performance period for the Promoting Interoperability and Improvement Activities is a minimum of 90 days, between January 1, 2018 to September 30, 2018. The AANA Research and Quality staff can help you understand individual and group reporting requirements. Please visit the AANA Quality Reimbursement website for more information about the Quality Payment Program today! The AANA Education Committee is seeking candidates who are interested in serving on the committee as a Delegate. The deadline for receiving completed candidate packets is January 7, 2019. The election will be held, and the winner announced, at the Assembly of Didactic and Clinical Educators (formerly called Assembly of School Faculty) meeting in February 2019. Be continuously involved in the didactic and/or clinical instruction of nurse anesthesia students. Attend the February Assembly of Didactic and Clinical Educators and Nurse Anesthesia Annual Congress during both years of their term. Attend Education Committee meetings and conference calls for the two-year term which begins immediately following the AANA Annual Congress in the year elected. The candidate information packet is available on the AANA website under CE & Education, Opportunities for Educators. Questions? 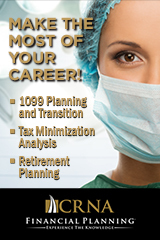 Contact the Education department at 847-655-1161 or education@aana.com. Implement a hand-hygiene program using guidelines from the Centers for Disease Control and Prevention or the World Health Organization. Improve compliance based on goals. Read the article for more information about how The Joint Commission surveys for hand-hygiene compliance and for tips on achieving compliance and improving the safety of patient care. SRNAs, are you interested in becoming a nurse anesthesia educator? CRNA educators, are you interested in mentoring students with an interest in education? Sign up for the Student Mentoring Program at the February 2019 Assembly of Didactic and Clinical Educators (ADCE). The program consists of a Student/Mentor Meet and Greet from 6:00 - 6:30 p.m., on Wednesday, February 13th, for the mentor/mentee pairs to meet each other. Students are paired with an educator from a program other than their own. Thursday, February 14th, is the one-day mentoring experience. Wherever the mentor goes throughout the day, the student will follow. The mentor introduces their mentee to their colleagues, involves them in their discussions, and takes them to lunch. SRNAs: One student who has been nominated by their program director is accepted from each nurse anesthesia program, and a student may participate in the mentoring program only once. Let your program director know now if you would like your name submitted! CRNA Educators: Volunteers are needed to serve as mentors. Please refer to the brochure for complete details about the program. Simply email the Education department at education@aana.com to nominate a student and/or sign up as a mentor by December 10, 2018. Running with 52,000 runners in the New York City (NYC) Marathon, Sarah Sellers, CRNA, placed 18th in her first NYC marathon, with a finishing time of 2:36:37. Congratulations Sarah! She finished second in her division in the Boston Marathon this past April with a time of 2:44:04. Learn how her life has changed since the Boston Marathon in this video. The Greensboro, N.C., News & Record reports that Heather Winslow, MSN, CRNA, ran the New York City Marathon in honor of Holden Hughes, the son of Chris and Stacy Hughes, MSN, CRNA. Four-year old Holden has neuroblastoma. Winslow raised more than $17,000 for the St. Jude Children's Research Hospital on behalf of Holden. It was Heather's first New York City marathon, and her eighth marathon overall. Nationwide is proud to be a sponsor of the Honor Flight Network. Honor Flight is an all-volunteer organization that takes veterans on a trip to the memorials dedicated to their honor in Washington D.C. Learn more about this cause and how you can help. As part of UCHealth, we focus on personalized care and the one reason we come to work each day: to make a difference in the life of each patient. Learn more. Sanford Health is seeking CRNAs to join our anesthesia team. Become part of a team dedicated to service excellence with a passionate commitment to care. Variety of cases to challenge your clinical skills including Cardiothoracic, Neuro, Ortho, General, ENT, Vascular, Pediatrics, Urology, and Robotics. Learn more. Whether you're a recent graduate looking for your first CRNA position or a seasoned professional interested in taking that next step, CRNA Careers is THE place that will help you further your career or get things started. As an AANA member, take advantage of career resources like resume-writing tips, interview advice and an evaluation of your resume through our Career Resource center - all for FREE. Plus, you will not only have access to posted jobs, but you can have top jobs delivered directly to your inbox with customized job alerts. CRNA Careers is here to help connect members to the best opportunities. Start Your Search Today! A Canadian study has found no evidence that surgery under general anesthesia during early childhood elevates the risk of poor developmental outcomes. Researchers arrived at their conclusion after analyzing 2,346 biological sets of siblings in which only one of the children underwent surgery prior to starting primary school. The retrospective population-based study compared physical health and well-being, social knowledge and competence, emotional health and maturity, language and cognitive development, and communication skills and general knowledge in the sibling pairs at age five to six years old. As determined by Early Development Instrument scores incorporating those five domains, there was no meaningful difference in early developmental vulnerability between the children with exposure to surgery and general anesthesia and the children with no exposure. Although research findings on the neurotoxic effects of anesthesia on the young brain are mixed, the results of the Canadian study add to evidence that early childhood exposure to anesthesia is not linked to unfavorable developmental outcomes. From "Influence of Surgical Procedures and General Anesthesia on Child Development Before Primary School Entry Among Matched Sibling Pairs"
JAMA Pediatrics (11/18) O'Leary, James D.; Janus, Magdalena; Duku, Eric; et al. New evidence suggests that better imaging time, image clarity, and nerve distance to the skin are achieved when ultrasound-guided sciatic nerve blocks in the popliteal fossa are performed in the supine position rather than prone or lateral positions. Because of superior visualizations, clinicians may be able to more effectively block the sciatic nerve—especially in trauma patients, who may be difficult to move because of intubation or multiple lines. Researchers led by University of Maryland assistant anesthesiology professor Ron Samet, MD, suspected that ultrasound images may be better with supine positioning because of better compression of tissues caused by downward pull on the leg toward the probe due to gravity at the same time the vector of the probe is pushing upward against the leg. In the prone position, though, the sciatic nerve is pulled by gravity away from the probe. Samet took ultrasound images of the popliteal artery and tibial nerve at the popliteal crease, nerve bifurcation, and sciatic nerve in 38 volunteers. The participants were scanned once on each leg in both the prone and supine positions, for a total of four images each. "We took those images and used computer analysis to identify the gray scale of the sciatic nerve relative to its background to define whether or not it was more recognizable when the patient was supine or prone," Samet explained. "We found, via computer analysis, the P values were quite significant for the ability to visualize the sciatic nerve against its background." Practitioners also found the best sciatic nerve image in 36.3 seconds with the supine approach, more than 10 seconds faster than the traditional approach. Samet presented the results at the 2018 Joint World Congress on Regional Anesthesia and Pain Medicine and annual meeting of the American Society of Regional Anesthesia and Pain Medicine. From "Imaging Best with Supine Positioning for US-Guided Popliteal Fossa Block"
On Nov. 2, the Food and Drug Administration (FDA) approved sufentanil sublingual tablets, a powerful new form of opioid to manage acute pain in adults. The drug, Dsuvia, is 10 times more potent than fentanyl. The approval comes just weeks after the head of the advisory board that reviewed it, University of Kentucky anesthesiology professor Raeford Brown, MD, expressed serious concerns about the drug. In a letter to FDA, written with the consumer advocacy group Public Citizen, he predicted the drug would bring "diversion, abuse and death" during its first months on the market. FDA Commissioner Scott Gottlieb, MD, said Dsuvia will be administered via pre-filled, single-dose applicators and only by health care providers in hospitals, surgical centers, and other medically supervised settings. He added that the drug is particularly well-suited for certain special circumstances, such as soldiers wounded on the battlefield who may not have access to intravenous analgesics. Dsuvia is expected to reach the market early next year under FDA orders to track distribution, evaluate whether providers are using the drug correctly, and monitor for diversion and abuse. From "FDA Approves Powerful New Opioid Despite Warnings of Likely Abuse"
Although intrathecal dexmedetomidine (DEX) has been used to prevent shivering in women undergoing cesarean section, researchers wondered if the technique was also effective for c-section after spinal anesthesia. The team from XuZhou Medical University in China performed a meta-analysis in an effort to answer that question. The investigation ultimately included half a dozen randomized clinical trials with an aggregate 360 participants. Compared with placebo, intrathecal DEX significantly lowered the incidence of shivering but not of postoperative nausea and vomiting (PONV)—although it also did not induce PONV, nor hypotension or bradycardia. However, according to trial sequential analysis comparing DEX with placebo—which the researchers performed as part of the study—no solid conclusions can be drawn based on the results of all outcomes. Additional study is needed to confirm the potential anti-shivering benefits of intrathecal DEX in the setting of c-section after spinal anesthesia, the authors concluded. From "Effect of Intrathecal Dexmedetomidine on Preventing Shivering in Cesarean Section After Spinal Anesthesia"
Drug Design, Development and Therapy (11/02/18) Vol. 2018, No. 12, P. 3775 Miao, Shuai; Shi, Mengzhou; Zou, Lan; et al. Researchers studied ambulatory shoulder surgery patients over a period of six years in an effort to better understand the effect of peripheral nerve blocks (PNBs) in this setting. The work, covering January 2011 through December 2016, included 950 patients who received a PNB and 211 who had the procedure without it. "Peripheral nerve blocks in ambulatory shoulder surgery were not associated with a significant difference in a composite of adverse postoperative outcomes," the team reported in the Canadian Journal of Anesthesia. "Nevertheless, given the lower than expected incidence and moderate effect size associating PNBs with post-discharge events, future large prospective trials are needed to assess post-discharge outcome." From "Study: Peripheral Nerve Block Use Not Associated with Increased Complications in Ambulatory Shoulder Surgery"
Data from 2011-2016 indicates that intravenous acetaminophen is not better than oral acetaminophen in curtailing opioid utilization in open colectomy. Researchers used a commercial healthcare database to identify 181,640 patients who underwent the procedure during that time frame, including about 25 percent who received IV acetaminophen as part of their care. Opioid consumption fell 12.4 percent in those who were administered more than one dose of IV acetaminophen on the day of surgery, versus 22.6 percent in those who took multiple doses by mouth on postoperative day one. Based on the findings, the researchers do not consider routine use of IV acetaminophen appropriate for open colectomy—especially considering the other analgesic options available. Expert reaction to the study, meanwhile, underscored the sometimes blind rush to embrace anything that promises to address the opioid crisis, even if the clinical evidence is not there to support it. That is not to say that IV acetaminophen should never be used, they emphasize, noting its value under certain circumstances—such as when a patient cannot tolerate the oral formulation of acetaminophen. Rather than standard use, however, they say the decision to use IV acetaminophen should be based on informed clinical judgment and patient circumstances within the context of clinical pathways and protocols. From "Routine Use of IV Acetaminophen Not Supported in Open Colectomy"